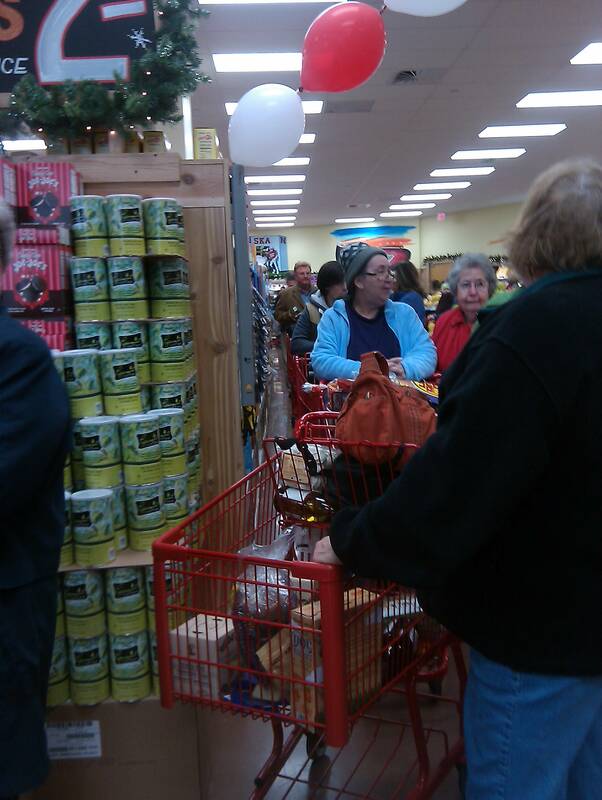 OMG OMG OMG Trader Joe’s is open! Yes, this line is about 20 people long. But you probably knew that, if you’re even a casual reader of the Lincoln Journal Star — which by my count has published no less than 10 stories mentioning the possible, impending and actual Coming of Joe since mid-summer. Sigh. This is called newsroom love. Certain people in the newsroom are overly excited about a certain store they love, and so the paper writes and writes and writes about it. Granted, readers seemed pretty excited about Trader Joe’s too, given the number of breathless comments each two-paragraph update would generate. I even got into trouble once when Trader Joe’s liquor license was approved by the Lincoln City Council, and I didn’t write about it. I very rarely wrote about liquor licenses being approved, and didn’t think it was newsworthy. I have to wonder what all the other grocery stores in Lincoln think about all those Trader Joe stories the Journal Star is writing, given that they (the existing stores) are the paper’s bread and butter. And something tells me Trader Joe’s is not going to be a big Journal Star advertiser, since I got my first ad from them in the mail yesterday. Not that that should influence the editors’ decisions about how much coverage is appropriate for the opening of a “quirky” (their words) California-based store. Anyway, I ventured into Trader Joe’s today to see what all the fuss was about, and a line stretched from the first checkout counter to halfway down the first aisle. No lie. I snapped a picture and left. I’ll check it out again when the mobs leave. In the meantime, I’m going to stick to my favorite neighborhood grocery store, Leon’s. Whenever even two people stack up in a line, they call in more checkers. And the money they make goes to local owners. They’re not as hip and trendy as Trader Joe’s, but they’re mine.